In Sunshine Academy, there is a class of lost causes known as "the leftovers", the Plum class. Ruby and Kanon Mizushirou navigate through high school life in a fantastical world while juggling their warped friendship with their crush on Mikage Shiraishi. I wasn't expecting anything good for this anime and today I watched 10 episodes. It was ok. Down below is the full review. The story is a simple school life about small problems that arise. 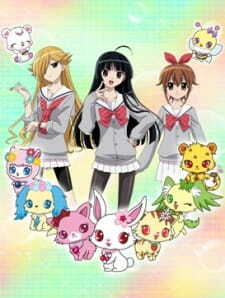 A school mixed with humans and creatures called Jewellpets. It's a kids anime through and through. The art is pretty good. The reason I got attracted to the anime was because of the art. The art is perfect for younger people, not so detailed like anime we adults watch. At times it is boring and you might just want to get the episode over and done with. I think it's suposed to be funny but I just didn't laugh. I couldnt get into it at all, but I do admit its not bad. Its really difficult to write a review about this anime. Everything was a 5/10 and it's not appealing enough. Maybe a kid would love this, but its just lame if u watch a bunch of school kids being kids and no surprises. I think this would be a waste of your time unless you love anime like Kamisama Minarai.